From critically acclaimed writer Brian Azzarello (100 Bullets, Superman) and red-hot artist Carlos DAnda (Outsiders) comes the story of one mans journey of self-discovery - and all the people he must kill along the way! In a world marred by brutal warfare, unjustified nation-building and corporate greed, soldiers like Michael Cray - code name: Deathblow - run the risk of becoming lethal puppets. The real question is, whos pulling the strings? Following a deadly mission, Cray is assumed dead by his superiors - until its discovered hes being held in a Middle Eastern prison. A daring commando raid rescues Cray, and the government will use any means to determine where his loyalties lie. 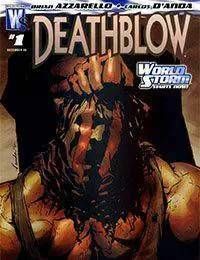 This puts Deathblow on a dangerous road, unsure of who his real enemies are and of who he can trust - including himself!